An electrician is a tradesman specialized in the electrical wiring of equipment, buildings, and stationary machines. Once you're a professional electrician, you'll have the education and ability to maintain and repair the existing electrical infrastructure as well as install new and complicated electrical components pretty much everywhere on the earth there is a need for electricity, from the sky to the sea. The civilized world needs you to ensure everything is connected and running smoothly. Becoming an electrician requires a combination of classroom and hands-on training. Hands-on training takes place in the classroom as well as through an apprenticeship. It will take several years to complete all of the necessary electrical training. But once you complete your chosen electrician program and an apprenticeship, you will move on to work as an electrician journeyman. 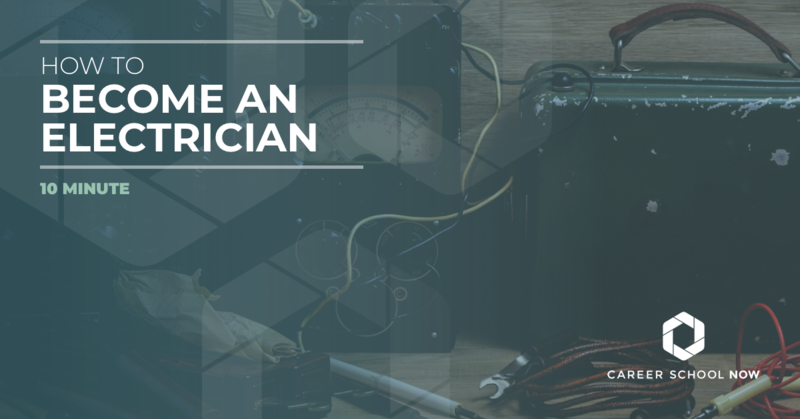 In this article, we will give you all the information you need to know about becoming an electrician. Find an electrician school near you. Electricians go through rigorous training. They have to know every aspect of their job, from safety to completion. Because electricity is such a vital part of modern-day society, it is taken for granted. But, when something happens, and the power goes out, a professional is called in to repair it. Here are some interesting and lesser known facts about electricians and why they are such respected professionals. Electricians train almost as long as intensely as doctors. Master electricians spend 8 years learning and mastering the trade, just the same as doctors in medical school. There are four main areas of expertise for electricians: Residential, Commercial, Industrial, and Outside Lineman. Which means, electricians specialize, much like doctors do. Electricians need to be in good shape, both physically and mentally. They need to have physical stamina to complete jobs that are in less than suitable conditions. And, they need the thinking skills in order to face the tasks in the best and most efficient ways possible, while remaining safe. Since technology is constantly one step ahead and moving at a rapid pace, electricians are perpetual students. To stay in touch with the growth, and to understand how all the new processes work, electricians have to take a lot of continuing education courses. Electricians make the world go round. They are necessary parts of our society yet are becoming more underrepresented. Electricians have great careers, and if becoming an electrician is on your radar then there’s no time like now to look into it! There are a few things to know before entering the electrical field. High school can prepare you for the beginnings by taking courses in math, shop, mechanical drawing, and other technical science classes. After high school, you will need to attend trade school or a community college that offers diplomas or degrees for electricians. Because it’s a hands-on job, electricians have to do an apprenticeship, where they will learn even more than they did in school. And, the electrician apprenticeship is a paid position so learning while earning is not a bad gig at all. Students will complete 144 hours of classroom education and 2,000 hours of on-the-job apprenticeship training. Each state has different licensing requirements, so it’s important to find out what is expected of you from your state. In most instances, a comprehensive exam is given which tests the knowledge and skills of the budding electrician. Coding and technology change rapidly which means electricians need to keep up with the times. So, continuing education is a must for electricians. An electrician apprentice is someone who is training to be an electrician through on-the-job training. They learn, firsthand, all that is involved with the daily doings of electricians. They’ll learn how to repair, install, and maintain the electrical of residential, manufacturing, and commercial buildings, depending on which aspect of the trade they are entering. To apply for an apprenticeship program, you must be 18 years old with a high school diploma or GED. You must have had one year of high school algebra and maintained a ‘C’. And, you must have a valid driver’s license. It’s important to find apprenticeship programs that are sponsored by national organizations because they are the most trusted. A joint training program between the International Brotherhood of Electrical Workers (IBEW) and the National Electrical Contractors Association is one of the most popular and well-known. It is called the Electrical Training Alliance. It’s one of the largest, with over 75,000 active and retired members and sponsors over 300 programs. The Independent Electrical Contractors (IEC) is not affiliated with a union. It has over 50 chapters and provides training to over 10,000 members nationwide, yearly. This is the national trade association for merit shop electrical and systems contractors. The Associated Builders and Constructors, Inc (Associated Builders and Constructors, Inc (ABC)) is non-union and promotes free enterprise within the construction industry. After you’ve completed your apprenticeship, you can apply for your journeyman electrician license. Every state in the country requires electricians to be certified and licensed. Many states expect proof of hours spent working as a both an apprentice and journeyman, so it’s important to save all your pay stubs, tax info, and school transcripts. A master electrician is an electrician who is highly knowledgeable and has vast experience working as an electrician and has been formally tested to prove it! To be eligible to become a master electrician, you must work for a minimum of four years as a journeyman electrician. Once you’ve met your state’s experience requirements, you can apply to sit for the exam. You can also take additional exams which will certify you as a master electrician in specialty areas such as signs, alarms, and telecommunications. Most master electricians continue their education through community colleges to keep up to date with all the latest, and greatest technology has to offer. It’s also a necessity in order to keep the license active. Find out more information about journeyman and master electrician careers. Diplomas/Certificates: The degree route is perfect for those who want to get on the fast-track by learning the trade and quickly hitting the field as an apprentice. It only takes a year to earn a diploma and then the student is ready for an apprenticeship. Courses typically taught in a diploma or certificate program are Intro to Electricity, Residential Wiring, Commercial Wiring, and Code. Many seasoned electricians choose to go back for certifications and diplomas, as well. It’s a great alternative for brushing up on their skills or learn new ones. Be sure that the program you choose allows you to apply your academic credits to your apprenticeship. Associate’s Degree: Going for the associate’s degree not only teaches the students about everything to do with electrical work, but the student also must take general education courses. Associate’s degree programs are a more well-rounded educational path that takes 2-4 years, depending on whether the student is full or part-time. Associate’s Degree programs will teach students Alternating Current Methods, Accident Prevention, Electrical Drawing and Blueprint Reading, Electrical Systems Analysis, along with other fundamental courses. The benefit to the associate’s degree is that the student is prepared to transition directly to apprentice, right after graduation. It also can be applied toward a bachelor’s degree, if that is the direction the student plans on going. Many apprenticeships accept associate degree credits, but the student still has to do the full 4-5 years of the apprenticeship program. Apprenticeships: Before you can even become an apprentice, you must pass an algebra and functions test, as well as a reading comprehension exam. If at first, you don’t succeed, you must wait six months before you can try again. Most of the training the apprentice will experience is through hands-on with an experienced electrician. There still will be some classroom training, as well. There are also four different types of specialty apprenticeships: Inside wireman, outside lineman, telecommunications technician, and residential wireman. Each program varies between 3-5 years in length. The apprentice will have all their previous education reinforced, along with more in-depth training in blueprints, electrical theory, electrical coding, and best safety practices. The duration of an apprenticeship program is 4-5 years but the apprentice will come out having real-world experience that they can apply to their careers as electricians once they pass the licensing exam. Apprenticeship programs are highly focused on the fundamentals of the business, and if they decide to go on to a four-year degree, it does not transfer any credits. But, the knowledge and experience will stay with them forever. For some more good information, read "A day in the life of an electrician". Certificates and associate’s degrees can cost between $1,000 and $11,000 including tuition and fees. It all depends on what school you attend. Apprenticeships can cost between $240-$1,420 per year. Additional costs will include books, tools of the trade, and, in some cases, room and board. There are a variety of scholarships available for students entering school to become electricians. Inside Wireman: Inside wiremen are electricians who specialize in the interior wirings of buildings, such as lights, electronics, appliances, and alarms. Outside Lineman: Electricians who are outside linemen handle higher voltages of electricity. They are the ones to deliver electricity to industrial or manufacturing facilities and other buildings. Service Electricians: These guys (and ladies) are problems solvers and troubleshooters. They are contractors or independent freelancers working to repair electrical problems in residential or commercial buildings. Construction Electricians: When it comes to construction projects including wiring, a construction electrician is hired. They take care of all the original wiring, electrical blueprints, and connecting the electrical for the building they are working on. Marine Electrician: Radars, radios, sonars and other necessary equipment on ships is what a marine electrician is in charge of taking care of. Research Electrician: A research electrician checks all the circuits within industrial and commercial labs. They provide technical assistance and solve problems with machines used for research. What's the difference between an Industrial and Commercial electrician? Between now and 2026, employments for electricians is expected to grow 9 percent which is average compared to all other careers. Due to the aging of many current electricians who are approaching retirement age, along with the fact that many employers are looking for qualified electricians and are having a hard time finding them. With the advancement in technology for buildings, knowledgeable electricians will be necessary for the required installations. Also, older buildings are aging, and so are the components that keep them wired, so electricians will be employed to repair and maintain them. The more well rounded the electrician, the easier employment opportunities will be found. Apprentice electricians earn about 40-50% of a full electrician salary. This translates to around $10 per hour. But, as the apprentice gains more experience, their pay will rise to match their skill set. Journeymen electricians median salary is $24 per hour. And, a new Master Electrician will earn a median salary of over $55,000. Electricians who own their own businesses will make more, depending on their reputation, location, and how many people they employ. Many small electrical businesses can see a profit of over $100,000 annually. Electricians who work in manufacturing and power generation bring home more than electricians who work in construction. The Bureau of Labor Statistics states that, on a whole, the median pay for electricians is $54,110. The highest 10 percent earned more than $90K.